Because of our clients eclectic personalities, we were able to experiment with different styles & color combinations. Even so, the priority for this kitchen space was efficiency & layout because of the client's professional chef background. Mixing personal style with tradition was key in this project. From the white perimeter cabinetry & simple door style to the vintage navy colored island. Mixing soapstone and quartz counter tops compliment the contrasting cabinetry & ties everything together. The antiqued brass hardware perfectly accents the whole look. The challenging aspect of this project was the lack of space. To keep the integrity of this classic 1920's home, our clients didn't want to intrude on the size of the original kitchen. This left us with limited options on layout; however, it did not limit us on design or deter us from experimenting with the space. Another challenge we faced was catering to a trained chef's cooking & storage needs. We needed to have enough drawer space for cookware, knives, small appliances, utensils, etc. This meant thinking outside of the box on layout & storage. In order to make the most of the space, we suggested that our client open up the pass-through to the dining area which then let in more natural light & created a more open look. We decided to center the island in the room to give the area flow & function. We also kept the bulky appliances, such as the fridge & ovens, in their own nook, leaving the rest of the kitchen feeling spacious & less heavy. To keep the kitchen as open as possible we advised to only have uppers adjacent to the range hood. We also suggested that they treat the window as one of the focal points of the kitchen because that is where most of the natural light comes in. Because the Schmitt family loves to cook, our team suggested The Galley Sink. It is not just a sink, but a work station. Super-functional, stylish, and the perfect place to prep, serve, entertain, & clean up (all in one spot!). Can you tell we are HUGE fans? We love this sink & so do the Schmitts. For the chef in the family, it is a dream come true & the perfect addition to a chef's kitchen. Two Toned Cabinetry. Yes or no? We love it when our clients are willing to take chances & mix color combinations, especially in the kitchen. We were so excited when this client wanted to choose a bold color for their island. Mixing bold & classic colors sets the tone of the room, which is why choosing the right stain or paint color is so important. In this case, the vintage navy color complimented the classic white. When clients want to branch out from an all white kitchen, but don't want to do something too crazy, we always suggest adding a pop of color to focal points in the kitchen. Often times it's the island or the hood mantel. 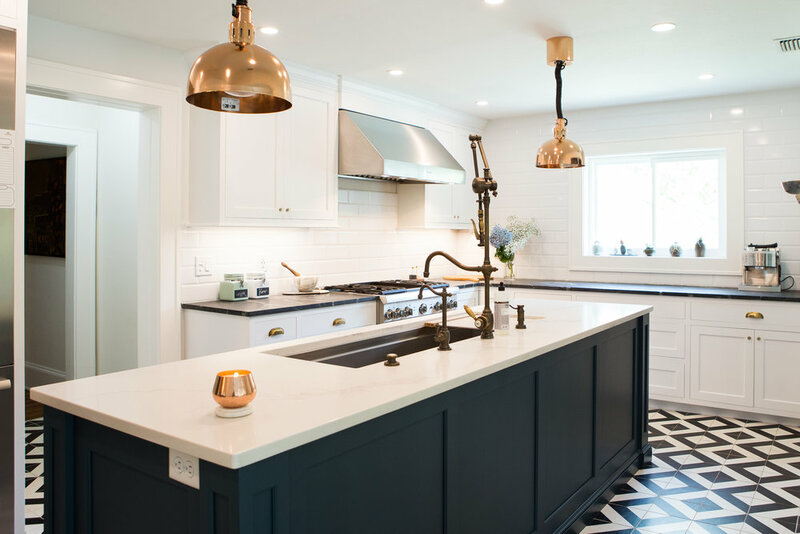 Incorporating color or stains to your kitchen is a great way to showcase your personal style and set yourself apart from the everyday white kitchen. We want to give a big thank you to the Schmitt Family for welcoming us into their home & allowing us to capture the beauty of their family and home. We are big fans of the Schmitt's & so happy to not only call them clients, but friends! We wish this family the very best.